If we know our readers (and we like to think we do), then we know you have the voices of angels. It’s a fact. With such beauty contained within, it would be a shame to keep it all to yourself. That’s why we invented karaoke bars—to let that inner light shine out. Whether you prefer to belt out the classics or give your twist to a modern hit, the following 10 karaoke bars should do you just fine. Yes KTV is known as the Karaoke Bar in Houston, Texas. They’re a “full service and upscale karaoke bar and club” with a BYOB option. This is a karaoke bar modeled after the popular Asian versions, specializing in hundreds of thousands of Asian tracks (along with 10,000 English songs). Norazo Karaoke Club in Dallas offers two charging options: by the hour, or a flat rate for three. The bar opens at 7 p.m. Tuesday through Thursday and closes at 2 a.m. Friday and Saturdays, the spot opens early at 6 p.m. and closes late, at 4 a.m.
Hi Tunes in Austin takes the traditional “noraebang” karaoke room from Korea and gives it a Texas twist. Visitors can choose their room size, number of hours, and food and drink. Then, they spend the rest of the night singing their hearts out. For those that aren’t as interested in getting up in front of a crowd of strangers but wouldn’t mind belting it out in front of friends, Hi Tunes is the perfect spot. Sportsman’s Bar in San Antonio has been a go-to spot for over 20 years. Since the mid-90s, they’ve been family owned and operated, serving up tasty food and a wide drink selection. 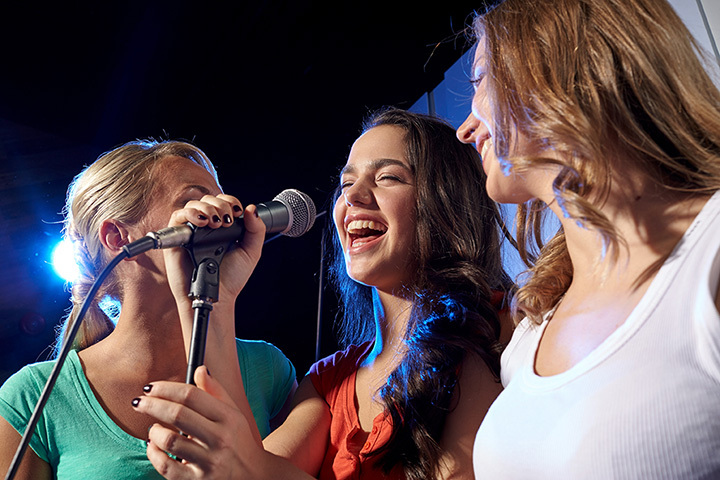 But the karaoke is what really makes this place stand out: come in Saturday night to take part in their designated Karaoke Night. Have you ever been in the mood for sushi, beer, and karaoke? If you’re in El Paso, you’re in luck. Kangnam Style Sushi has it all. Don’t want to sing in front of other sushi-eaters? Check out their private VIP room options. The Truelove Bar takes their name seriously: in addition to selling great craft beer and delicious spirits, they hope to become your favorite social club—a place to express and discover your “true loves,” if you will. What better way to find the person of your dreams than to bust out your karaoke moves? Exactly—there isn’t one. Ever want to sing where your parents sang? Stand in the spot where your mom and dad might have met and fallen in love? At River Bottoms Pub, your singing can carry through the ages as you join a long tradition of singers, drinkers, and partiers to have sung their hearts out in these hallowed halls. And if you’re not into that hippie-dippie stuff, keep in mind that they’ve been in business since 1956 and certainly know how to show you a good time. Stop me if you know how this goes: You’re hanging out on a Saturday afternoon and you don’t have anything to do for the night. You know you want a place that has custom cocktails, free pool tables, a dance floor, and karaoke, but you have no idea what kind of magical place might fit the bill. Then it hits you: Jack’s Pour House! Of course! They have all this and more—everything you need to turn your boring Saturday into a night to remember. Say it with me: Karaoke is a way of life. That’s why Sidetracked Pub and Grill offers it seven nights a week. At Sidetracked, you never have to spend another dismal night without the joy of music dancing on your lips. According to Skooners Grill and Bar, “Life isn’t a cabaret. It’s a dive bar.” Of course, that doesn’t stop them from giving in to their inner cabaret every once in a while—specifically, every Friday and Saturday, where DJ Damon takes the karaoke floor. Check their website for the entire event schedule.